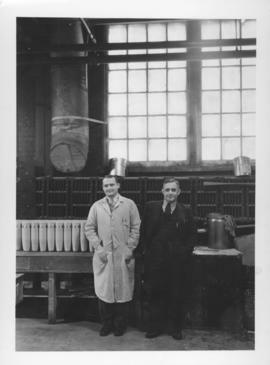 Photograph shows interior view of Dominion Bridge Company during World War 2 munitions retooling, Plant Manager William Albert Daum and Chief Government Inspector Howie posing for shot. Date of photograph is approximate, ca. 1940. Photograph shows interior view of Dominion Bridge Company during World War 2 munitions retooling, Plant Manager William Albert Daum appears in background wearing hat and smock. Date of photograph is approximate, ca. 1940. Photograph shows interior view of Dominion Bridge Company during World War 2 munitions retooling, line of female workers at work station posing for shot. Date of photograph is approximate, ca. 1940. Photograph shows interior view of Dominion Bridge Company during World War 2 munitions retooling, female workers at work stations in foreground. Date of photograph is approximate, ca. 1940. Photograph shows interior view of Dominion Bridge Company during World War 2 munitions retooling, female employees working on shell cases in foreground. Date of photograph is approximate, ca. 1940. Photograph shows interior view of Dominion Bridge Company during World War 2 munitions retooling, group shot of female workers posing in dresses. Date of photograph is approximate, ca. 1940. Stamp (on verso): Photos by H. K. White, 1095 McMillan Ave., Phone 41778 [?]. Photograph shows interior view of Dominion Bridge Company during World War 2 munitions retooling, group shot of workers standing side by side in line behind work station. Date of photograph is approximate, ca. 1940.